While using laptop or netbook, battery is an important component to keep eye on. We need to constantly check the status of battery to know how long battery is good to run the portable device. There is in-built Windows functionality for basic battery status which can be enhanced by battery utility like BatteryBar. 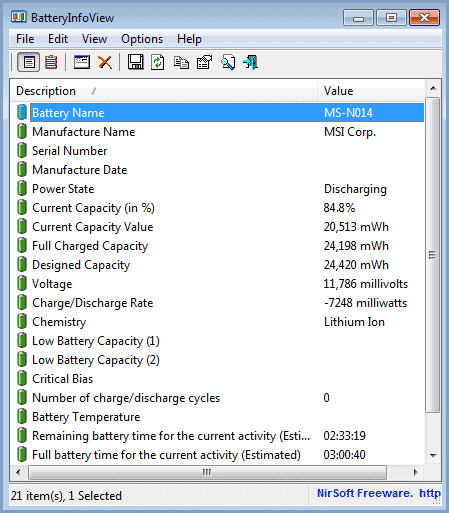 You can get more information about battery on your laptop or netbook device including battery name, serial number, number of charge cycles and much more using free BatteryInfoView utility. 1. Basic battery details like name of the battery and company that manufactured battery currently installed on your laptop. It also displays battery manufacture date and it unique serial number, if available. 2. It indicates on current power state of the battery. This may include either of: Charging, Discharging, AC Power or Critical state. 3. It shows detailed charge capacity information of the battery like current capacity in percentage and in absolute mWh units (milliwatt-hours). 4. You can check designed capacity of the battery, which means the battery capacity when it was completely new as against the Full charged capacity indicating the current total charge value in mWh units. 5. It also provide information about battery voltage and charge – discharge rate in milliwatts. You can also know the battery’s Chemistry type among: Lithium Ion, Nickel Cadmium, Nickel Metal Hydride and so on. 6. You can check total number of charge and discharge cycles battery has undergone over period of time during its usage. 7. It also display the usual battery charge information like total time remaining before battery runs out and time required to fully charge the battery from the current power state. This utility also has log information window (press F8 to switch to this mode and press F7 to go back), where you check technical details by going through battery log information with aspects like: event time, power state, capacity, rate, voltage and event type. So, if you want to check each and every possible aspect of battery installed on your laptop or netbook, then grab this utility to know all.